24x24x12 Puracel ASHRAE 65% Box Filter No Header | Air Filters, Inc.
Air Filter Inc.™ Puracel™ ASHRAE Box Filter w/Header’s are manufactured from glass microfibers Puracel media. Both edges of the aluminum pleat separators are rolled to prevent media chaffing or tearing and provide maximum integrity. These Rigid Cell filters offer high surface area to depth ratio provides the maximum amount of effective filter media in areas of minimum in-line duct space. 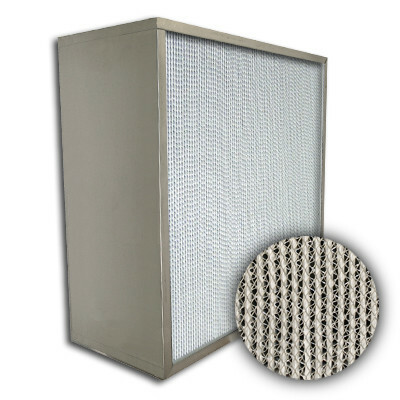 Puracel™ filters are excellent solution for variable air volume systems along with high humidity enviroments. 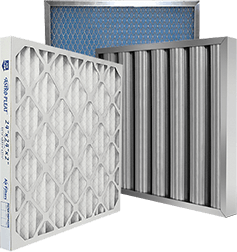 Air Filter Inc.™ Puracel™ ASHRAE Box Filter w/Header’s are designed to meet UL class 1 requirements and built for industrial process applications requiring Ridged Cellerature applications. The media is a water resistant glass fiber mat formed into a pleated design with aluminum corrugated separators to maximize filter area. Hemmed aluminum separators prevent media damage and provide uniform pleat spacing. Media pack is sealed into frame using a compression fit and batted glass fiber seal. Single header, double header or box style frame is constructed from Galvanized Metal. Each filter is constructed with upstream and downstream face guards as well as cross bracing straps on downstream side.